Fingerpicking guitar of Africa is a peculiar term. Why? Because it’s entirely possible (and very likely) that fingerpicking itself originates from Africa. So calling it the above, special way might be unnecessary. Nonetheless, most people probably know fingerpicking from the great American guitarists like Merle Travis or Chet Atkins. Or at least from the great Australian Tommy Emmanuel. Some of the inquiring ones go as early as ragtime guitar, and discover Blind Boy Fuller or Elizabeth Cotten, among others. By mentioning those artists, we have pretty much zeroed in on the essence of what fingerpicking guitar is. It’s the kind of fingerstyle where you play the melody line on top and at the same time, add some kind of a rhythmic, and/or alternating bass line played with the thumb below. This is the case with this example as well. While some style include a brushing motion, I’ve used what’s considered to be the gentler way to do it. It is the alternating thumb playing the bass notes. The melody line gets represented by the rest of the available picking fingers, and it’s really up to you which ones you use for the task. Some people can get away with the index (or middle) finger alone, I have used the index and the middle ones. It enables you to play the melody more economically. If you’ve never tried to play fingerpicking patterns before, it’s gonna take you some practice, so don’t be impatient. Follow the TAB and try to internalize the rhythm of the pattern as a whole. As far as the fretting hand goes, the piece doesn’t put special obstacles in your way. The chord shapes are the usual major and minor barre ones. There are some well known jazzy grips as well. You’ll be able to get them from the tablature as well as watching the video all the way through. 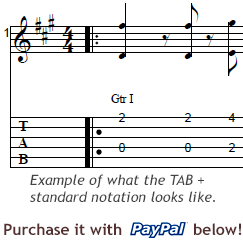 Note that the 2nd part of the tune moves into a higher position on the fretboard, but otherwise, there are no big jumps or stretches in either direction.